Lanthanide elements are essential parts of today's high-tech commodities including flat-screen TVs, cell phones, electric cars, and satellites. While the demand for these elements is high, separating lanthanides from impurities (other lanthanides) is extremely difficult. Industry uses liquid-liquid extraction. The target in water slips into an oil phase with the help of an extractant molecule. Impurities remain in the water. For decades, researchers have designed novel extractants. However, they've largely overlooked the subtle effects of the thin layers of water that come along for the ride, wrapped around the target. 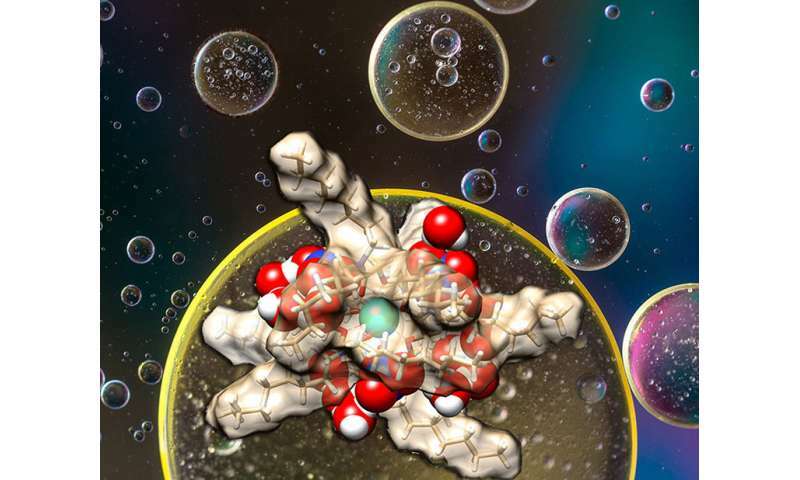 New research reveals peculiar arrays of water molecules affect how the extractant works. The findings emphasize the benefit of controlling subtle outer-sphere interactions. Liquid-liquid extraction of lanthanides is a well-developed technology. Why certain extractants are extremely selective and others aren't is not well understood. Also, how to design improved selectivity isn't well known. Knowing how water that's extracted with the target element influences the separation is a vital step toward designing better extraction systems. These systems can get the lanthanides needed for high-tech devices. Fundamental understanding of selective recognition and separation of lanthanide ions by chelating agents is of crucial importance for advancing sustainable energy systems. Lanthanides are difficult to separate from each other because of similarities in their physical and chemical properties. Most separation processes take advantage of a small decrease in ionic radius that occurs across the lanthanide series. These separation processes use two liquids. The liquids are like oil and water. They can be mixed together but always separate back into different layers. During the mixing, the extractant liquid pulls out the target lanthanide complex, surrounded by layers of water molecules. The extractant liquid contains arms, called ligands, that grab the lanthanide. For an ideal ligand, the decrease in ionic radius would result in steadily increasing extraction across the series. That is, the ligands would capture more lutetium (the lanthanide with the smallest radius) than lanthanum (with the largest radius). However, with the diglycolamide ligand, lanthanide extraction increases across the light to middle lanthanides but the selectivity remains almost constant across the smaller, heavy lanthanides. The collaboration between Colorado School of Mines and Oak Ridge National Laboratory elucidated the origin of lanthanide selectivity through complementary investigations integrating distribution studies, quantum mechanical calculations, and classical molecular dynamics simulations. The results show a relationship between coextracted water and lanthanide extraction by the diglycolamide ligand across the series. The finding points to the importance of the hydrogen-bonding interactions between outer-sphere nitrate ions on the ligand and the lanthanide complex and water clusters in a nonpolar environment. Based on the experimental and density functional theory studies, the mechanism underlying water uptake is related to the surface area of the nitrate counterions available to interact with coextracted water. Molecular dynamics simulations further elucidate that outer-sphere nitrate ions on the ligands form hydrogen bonds with water molecules. In a broader perspective, these results have significant implications for the design of novel separation systems and processes for trivalent lanthanide ions, emphasizing the importance of tuning both inner- and outer-sphere interactions to obtain total control over selectivity in the liquid-liquid extraction of lanthanides.